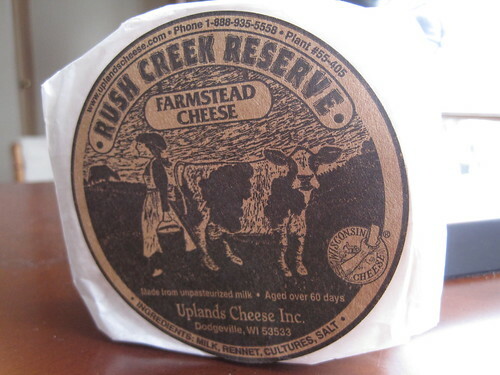 Stumped for what to get your favorite cheese lover this Christmas? Here are our top five picks. 4. 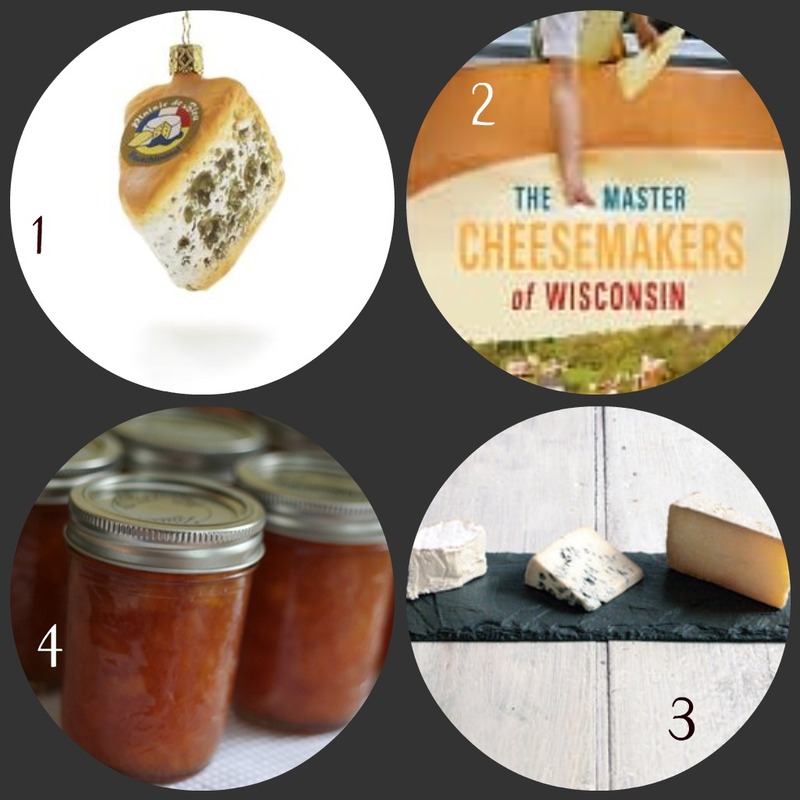 Cheese Lit — We particularly enjoyed Cheesemonger: Life on the Wedge, The Cheese Chronicles, and Master Cheesemakers of Wisconsin this year – or a subscription to Culture the magazine. 3. Cheese Boards. One can never have too many surfaces on which to display and serve cheese. These slate boards from Brooklyn Slate are all the rage this holiday. 2. Cheese Condiments. A selection of jams, honey, mustards, pickles and crackers will make any cheese lover swoon. Madame Fromage has some excellent suggestions. 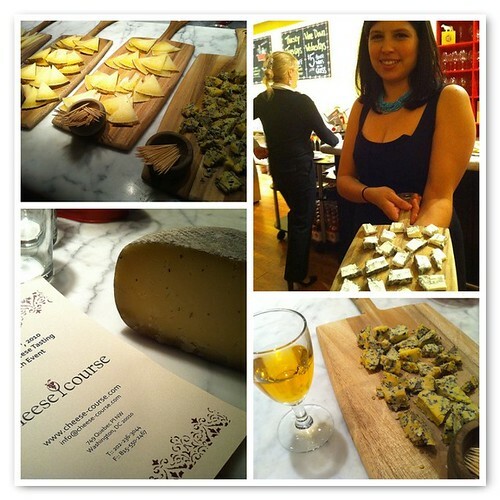 Last night I attended the launch party for DC’s newest cheese enterprise, The Cheese Course. 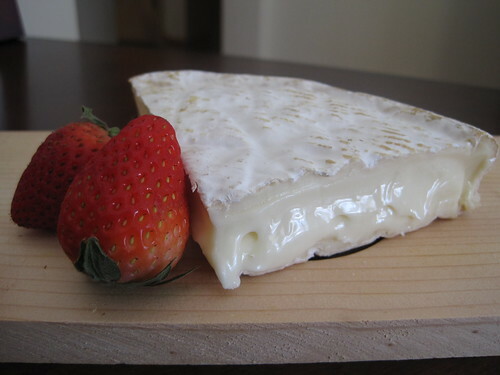 Fromager Carolyn Stromberg, well known among DC cheese lovers for her work running the cheese cave at Old Hickory Steakhouse, is setting out on her own to teach cheese appreciation classes around town. At last night’s event, hosted by Cheesetique, Carolyn led guests through a guided tasting of several wines and cheeses, beginning with a sparkling wine and triple-cream L’Explorateur. “I always like to start a tasting with sparkling wine,” explained Carolyn, “because it’s festive.” It’s also hard to go wrong in matching a sparkling wine with cheese, which makes it an easy choice for beginners. Carolyn went on to lead us through a white, two reds and on to the dessert course, Sauternes with Sweet Grass Dairy‘s Asher Blue from Georgia. The Sauternes was a little sweet for my liking, but well suited for the assertive blue. My favorite pairing of the night was the California Queen of Hearts pinot noir with Abbaye de Belloc. (I’m a bit of an Oregon pinot snob, but this was a really delightful and fruity California rendition that would go well with a variety of cheeses.) I was also delighted to try the Cinerino, a mild, almost floral tasting, ash-rubbed sheeps-milk cheese from Casa Madaio in Campania, Italy. 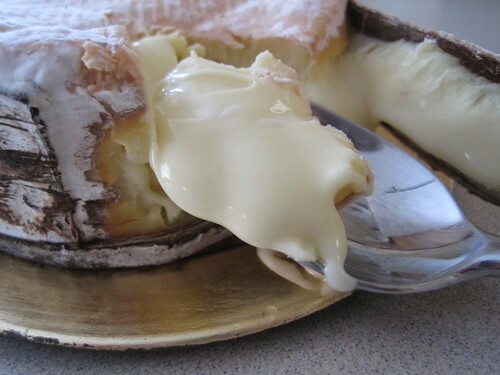 DC has a wealth of fabulous cheesemongers and shops, but too few opportunities for the cheese curious to study the subject matter more in depth. Carolyn’s passion for cheese is evident, and her casual approach will put even novices at ease as she leads them through a guided pairing. 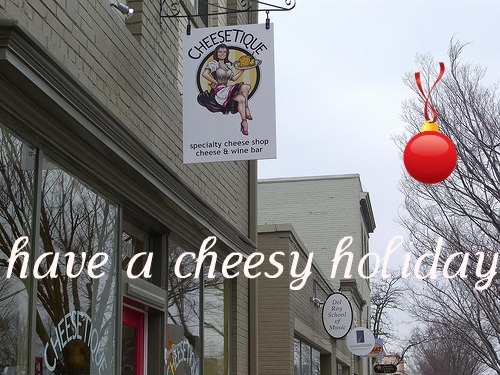 Visit her website and contact her today to schedule a cheese tasting for your holiday party. Plans to host public classes around town are in the works, so stay tuned and we’ll be sure to give you a heads up when they’re scheduled. Happy National Cheese Day, y’all! Regular readers of Cheese + Champagne know that Colleen and I never need a holiday to serve as an excuse to eat cheese, but we’re happy to mark the occasion all the same. 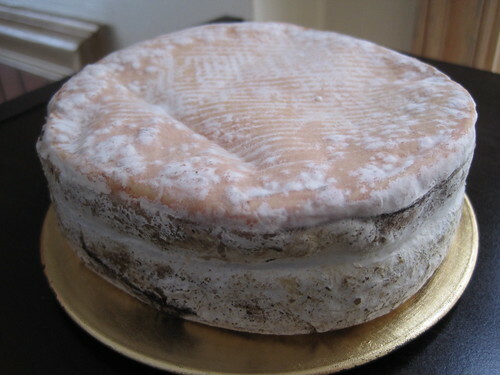 If you’re looking for something different to try for Cheese Day 2010, consider Corsu Vecchiu, a sheep’s-milk cheese from the island of Corsica. 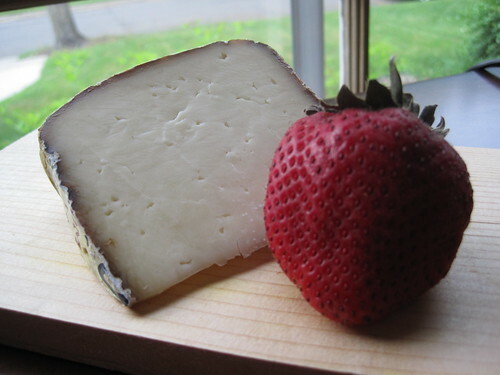 I hadn’t noticed this cheese before Monday, when I went to Surdyk’s for its cheese sale, and it was on the list of top 20 staff picks. 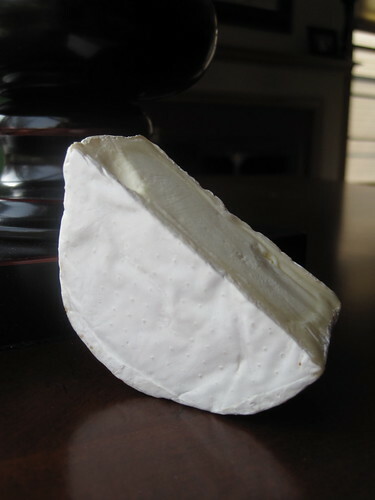 One taste and I was ready to buy a wedge – despite being a sheep’s-milk cheese, Corsu Vecchiu doesn’t carry the oiliness that characterizes so many of its ovine counterparts. I was surprised and delighted with its lightness both in flavor and in texture and the subtle saltiness that comes through at the end of each bite. I would have eaten my entire wedge in one sitting if I hadn’t stopped myself, but I managed to make the cheese last for two sittings. Surdyk’s recommends a medium red wine on the side, like Pinot Noir or Nebbiolo. I had neither in the house (I’m still rebuilding my wine supply after nine months of abstaining), so I enjoyed the Corsu Vecchiu with some fruit for a very satisfying snack. Which cheese(s) will be enjoying for National Cheese Day this year? Share your picks with us! This sentiment doesn’t appear until the very end of Gordon Edgar‘s new book, “Cheesemonger: A Life on the Wedge,” but its importance can’t be overstated. In our modern foodie culture, it’s easy to become a snob about the types of food you enjoy, but Gordon, the cheese buyer at San Francisco’s Rainbow Grocery Cooperative, takes the snobbiness out of cheese with his really enjoyable memoir/cheese manifesto. Colleen had the pleasure of meeting Gordon when she visited San Francisco last October, and now I am totally jealous because after reading this book he seems like he’d be a fun conversationalist. I’m not going to write a book report here because I’m 31 years old and stopped writing book reports in middle school, but I will urge you to pick up a copy of “Cheesemonger” at the book store or library. You don’t have to be a cheese lover to read it, though it’s fun if you are because you can knowledgeably nod your head when Gordon talks about the virtues or pitfalls of specific cheeses, but it’s accessible enough for anyone who enjoys an intelligent discussion about food. 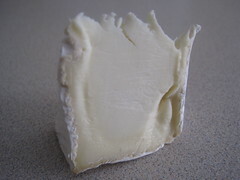 It’s fascinating to read how Gordon’s background in the Bay Area’s punk activist scene actually prepared him well for his unintended but ultimately successful career as a cheesemonger, and he does an excellent job of educating readers about the basic components of cheese (i.e. milk, rennet, mold, salt, bacteria) while weaving in colorful stories from his travels to domestic and foreign cheesemakers, cheese conferences and trade shows, and days behind the cheese counter at Rainbow. For those of us who romanticize the life of the cheesemonger, the book will leave you with a better impression of the work that goes into building and maintaining retail cheese department or store and make you appreciate your local cheesemonger even more! If nothing else, read this book to get gems like this line: “A good cheese person can steer you to the right gateway goat cheese that won’t make you feel like you stuck your nose in a goat’s crotch.” If only we could all be so eloquent!